When Bob Robinson thinks about his recent stay at Methodist Hospital, his mind immediately goes to one of his nurses. 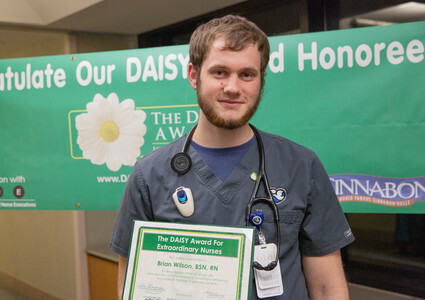 “Brian stood out like a beacon of light on a dark night,” Bob wrote in nominating Brian Wilson, BSN, RN, for the DAISY Award. The nationwide DAISY Award program celebrates extraordinary skill and compassionate care given by nurses every day. For his care, Wilson was honored as the November DAISY Award winner for Methodist Hospital and Methodist Women’s Hospital. Wilson started on the Methodist Hospital Progressive Care Unit on 6 North in October 2017 after graduating from Nebraska Methodist College. He cared for Bob while he recovered from surgery and illness. The connection was so deep that Bob and his wife wished they could adopt their attentive young nurse. 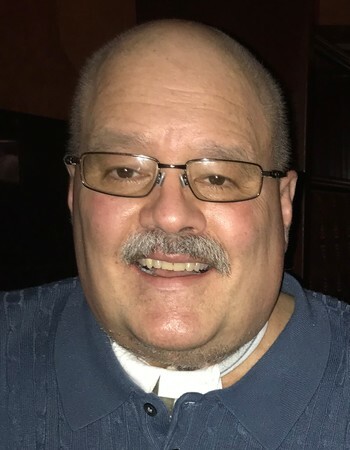 A tracheostomy patient living with diabetes, Bob wrote about how the sugar-free popsicles Wilson would deliver soothed his tender throat. He also noted how Wilson was quick to respond to medical emergencies elsewhere whenever they would arise. “If we were talking and Brian need to tend to an emergency, he was gone! The way it should be. Someone needed immediate medical help, and he was there!” Bob wrote. Wilson said receiving the DAISY Award so early in his nursing career was a “confidence booster.” But the care he provided was all in a day’s work, bringing Methodist’s “Meaning of Care” motto to life with each patient. “It’s just genuinely caring about somebody’s outcome, and doing whatever you need to do to make it happen,” Wilson said. For Bob, the result was an experience worthy of praise. Above all, he wrote, he appreciated Wilson’s professional and humble service. Read Bob Robinson's nomination of Brian Wilson, BSN, RN, for the DAISY Award. To nominate a nurse at Methodist Hospital or Methodist Women’s Hospital for the DAISY Award, visit www.bestcare.org/daisy. Read more inspiring stories about Methodist patients and staff members.